The T-Rex Phaser gives you everything you need for a gorgeous phased sound using just two simple controls: RATE and DEPTH. And it sounds great no matter which settings you dial in -- from a deep, slow rotation to a light, "watery" shimmer. The Phaser comes with two modes: Modern and Vintage. Choose Modern for a crisp, thick-sounding phase, and Vintage for that classic analogue vibe. 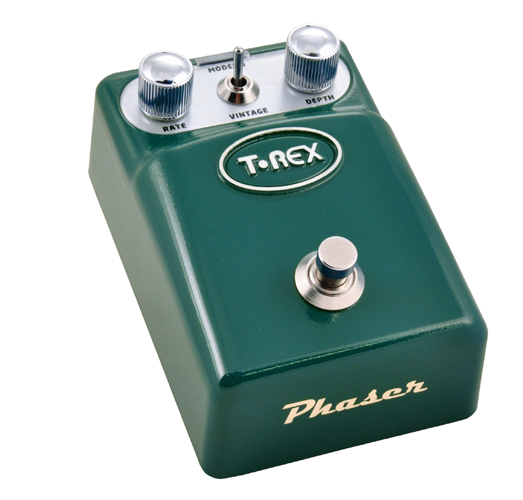 The Phaser is part of the T-Rex ToneBug series, a growing line of pedals that combines the classic T-Rex tone found in their high-end pedals with intuitive, uncomplicated controls -- all at a price that any guitarist can afford.